﻿RESTON, Va. – A nuclear medicine scan may locate prostate cancer recurrence after radical prostatectomy early after disease recurrence and could help guide salvage radiotherapy, according to new research from the University of California Los Angeles (UCLA). The study, which utilizes PET/CT with gallium-68 prostate-specific membrane antigen (68Ga-PSMA-11), is documented in the featured article in the February issue of The Journal of Nuclear Medicine. 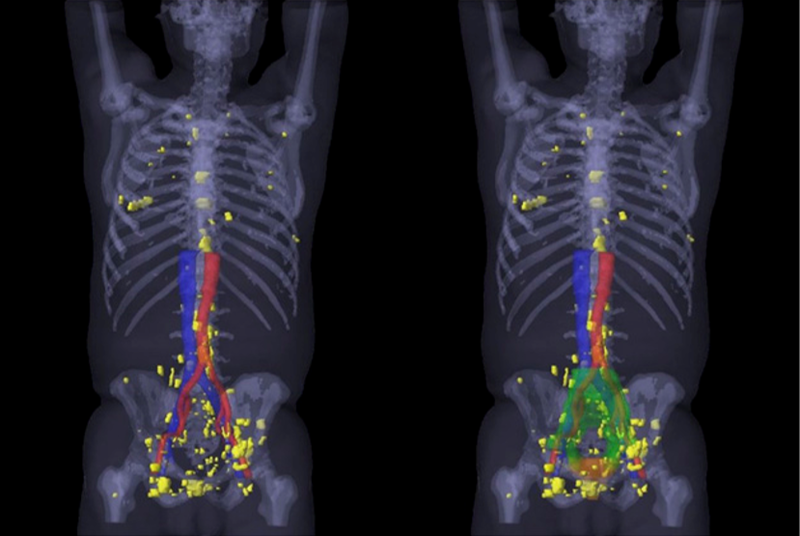 In the following video, Jeremie Calais, MD, and Nicholas G. Nickols, MD, PhD, at UCLA explain their research and the potential benefits of PSMA PET/CT for prostate cancer patients with biochemical recurrence after radical prostatectomy. Prostate cancer biochemical recurrence occurs in 20 to 80 percent of patients within 10 years after radical prostatectomy and is difficult to treat. Salvage radiotherapy is the main option for treatment, but the imaging modalities currently used are not sensitive enough to identify the location of recurrence until it is too late, leading to a “best-guess” approach for targeting the radiotherapy. Nearly half (132 patients or 49 percent) had a positive PSMA PET/CT, and 52 (19 percent) had at least one PSMA-positive lesion that was not covered by the consensus clinical target volume (CTV). The two most common PSMA PET–positive lesion locations outside the consensus radiation fields were bone (23/52, 44 percent) and perirectal lymph nodes (16/52, 31 percent). FIGURE: A 3-dimensional map of the PSMA–positive lesions outside the standard radiation fields. This is a 3-dimensional map of the PSMA–positive lesions (yellow) of all 52 patients with recurrence outside consensus CTVs (23 patients with recurrence outside only and 29 patients with recurrence outside and inside consensus CTVs), created by rigid registration of each patient’s CT image to template patient’s CT image, followed by transfer of each PSMA–positive lesion contour to template patient CT image (MIM, version 6.7.5; MIM Software Inc.). On right side, 3-dimensional prostate bed consensus radiation fields is shown in orange and 3-dimensional pelvic LN consensus radiation fields in green. Credit: Jeremie Calais, Nicholas G. Nickols et al., UCLA, Los Angeles, Calif. Authors of “68Ga-PSMA-11 PET/CT Mapping of Prostate Cancer Biochemical Recurrence After Radical Prostatectomy in 270 Patients with a PSA Level of Less Than 1.0 ng/mL: Impact on Salvage Radiotherapy Planning” include Jeremie Calais, Johannes Czernin, Minsong Cao, Amar U. Kishan, John V. Hegde, Narek Shaverdian, Kiri Sandler, Fang-I Chu, Chris R. King, Michael L. Steinberg and Francesco Ceci, UCLA, Los Angeles, Calif.; Isabel Rauscher, Technical University of Munich, Munich, Germany; Nina-Sophie Schmidt-Hegemann, University Hospital, LMU Munich, Munich, Germany; Thorsten Poeppel and Philipp Hetkamp, Universitätsklinikum Essen, Essen, Germany; Ken Herrmann, UCLA and Universitätsklinikum Essen; Wolfgang P. Fendler, UCLA and Ludwig-Maximilians-University, Munich, Germany; Matthias Eiber, UCLA and Technical University of Munich; and Nicholas G. Nickols, UCLA and VA Greater Los Angeles Healthcare System, Los Angeles, Calif.